Fall is well underway, which means I’m already late in getting my fall-winter wardrobe planning done. There are reasons, of course. There were preparations for the ASG Chicago fashion show last Saturday, for which I collaborated with a friend to coordinate submissions and prepare the lineup and then I wrote the commentary for the 65 entries that walked the runway. There were 67, but one of mine and one other had to be pulled because they didn’t get finished. Before that, I was working on a jacket for a challenge for the Haute Couture Club of Chicago. The challenge topic was actually my idea, so I wasn’t planning to enter the challenge, just show the jacket. It, too, is unfinished. Sigh. Oh, and there’s the dress I promised to a very dear, very understanding friend almost a year ago. And then there are the countless garments I have in my head, some of which seem urgent because they belong in my core wardrobe. So, if the title of this post left you wondering what wardrobe planning has to do with peace of mind, the best explanation I can give is that it helps me clear a calm space in my head. Sometimes, creative paralysis stems from something other than perfectionism. Or maybe it is actually a form of perfectionism. Sometimes I can’t dig in and do one thing because all the things I have to or want to do are vying for my attention. Pretty soon I’m feeling overwhelmed and I can’t decide what project to work on first because I’m sure I’ll never get through all the projects in time for this season. Does any of this sound familiar? In reading about strategies for overcoming procrastination or perfectionism (great avoidance activity!) I’ve seen this syndrome described as mental static or mental clutter. The clutter analogy resonates with me, because I’m one of those people who has to take a break from work from time to time just to sort through the piles of paper on (and sometimes surrounding) my desk. I’m convinced it’s impossible to think in the midst of clutter. Yes, organizing papers and tossing months-old to do lists does sound like another avoidance activity, but I find it very useful. I feel as if I’m getting a fresh start when I sit down at my desk again and the writing goes much better. So, how can this strategy be applied to wardrobe planning for a sewist? I’ve tried lists because I’m a compulsive list-maker. That doesn’t work, because the list goes on and on. I’ve tried flow charts – same problem. Plus there’s the whole mastering-flow-chart-making-time-sucker issue. Last summer, I stumbled on a method that actually worked. I was “shopping” in my fabric collection (I hate the word stash) for a piece of fabric I thought I had for a blouse I wanted to make when it occurred to me that I should pull out all the summer fabric I wanted to work with and spread it out on a table. 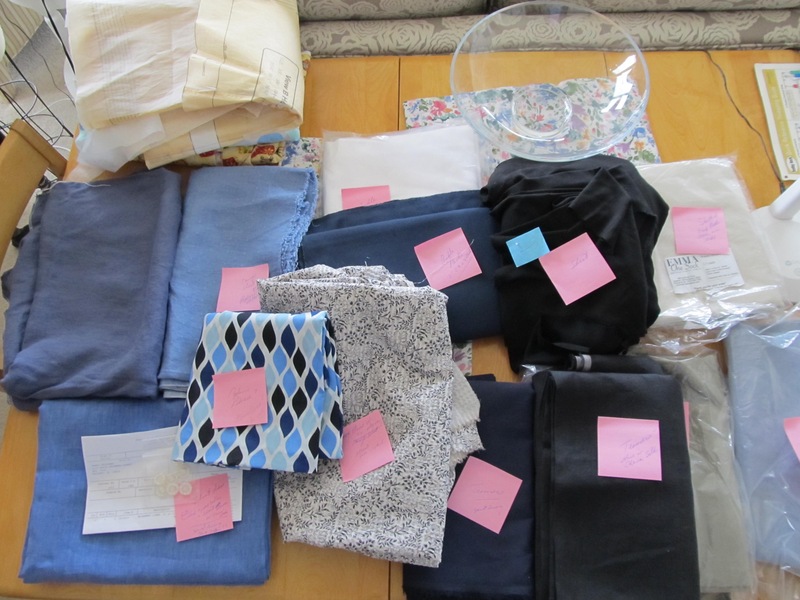 I sorted by type – bottom weight, blouse-weight, linen I had planned to use for a dress, and knits. I labeled them with Post-It Notes and what emerged for me was a clear picture of what I wanted to do with each of the fabrics in front of me. It also became clear that I had to eliminate some pieces, or at least defer them until next year. The next step was to inventory what I needed for the pieces I planned to sew. What linings did I need and did I have them? How about interfacing, zippers, thread, etc. The last step was to prioritize. What did I find myself reaching for most often that wasn’t in my closet yet? Of course, summer is really short and it’s even shorter if you don’t get started until July. That means I didn’t get through everything I planned out that day, even after the culling I did. But that really didn’t matter. 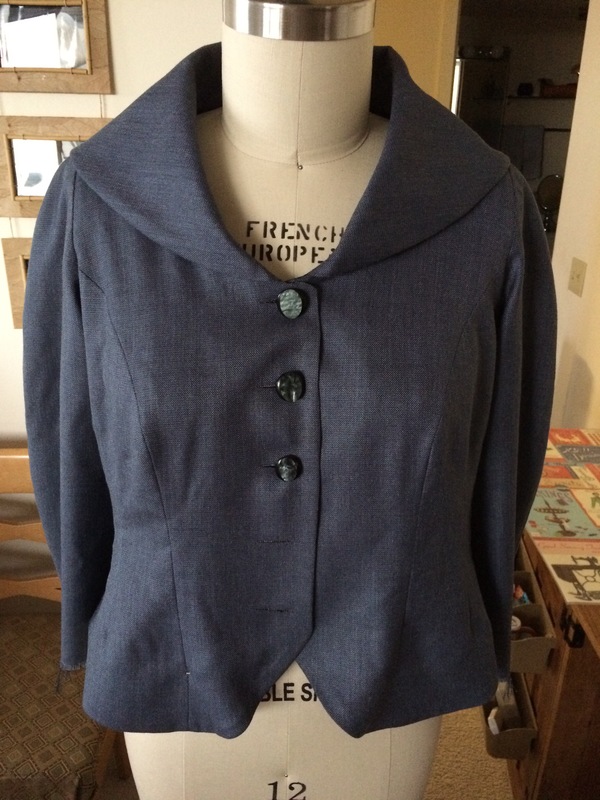 What mattered is that I had cleared the clutter from my head and created a calm, quiet place that allowed me to work on one garment at a time and enjoy wearing each one when it was done.